Any Massachusetts Hall presidential transition—like the current one from Drew Gilpin Faust to Lawrence S. Bacow—naturally brings to mind questions about University leadership: who is best equipped to chart Harvard’s course, in the prevailing circumstances, to the age that is waiting before? So the arrival of An Academic Life is fortuitous and timely. 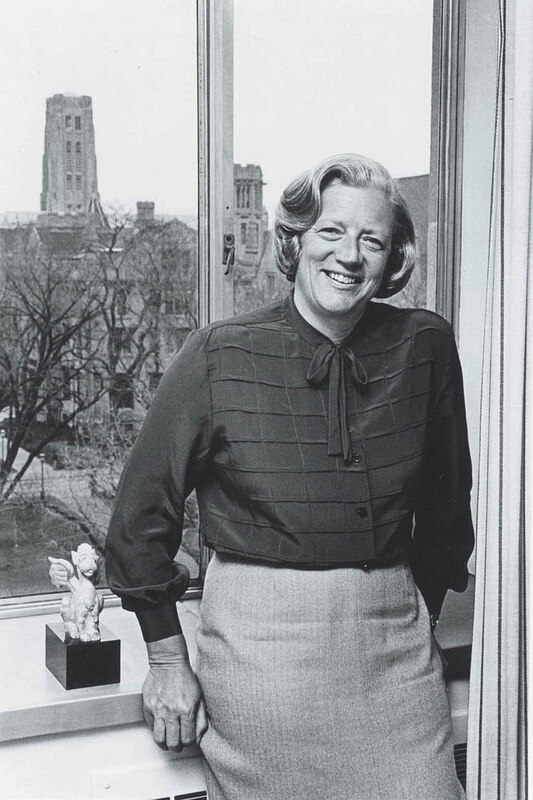 The memoir of Hanna Holborn Gray extends from her youth and development as a scholar of Renaissance intellectual history trained at Harvard (Ph.D. ’57), through her seriatim roles as dean of the College of Arts and Sciences at Northwestern, Yale Corporation fellow/provost/interim president, and University of Chicago president. Those who have observed segments, or all, of Gray’s leaderly career from afar will recognize her simultaneously plain-spoken and formidable manner in her title. (Further insight comes from the austere citation accompanying her 1995 Harvard honorary degree: “Powerful in judgment, humane in values, profound in learning, incisive in wit. She has lifted American education ever higher.”) She has chosen to construct a record that focuses almost exclusively on her life in and of academe—and to reveal little about her adult, inner life otherwise, apart from a couple of affectionate sections about her late husband, Charles Gray ’49, JF ’56, Ph.D. ’56, himself a scholar of legal history. The Faculty of Arts and Sciences had one female full professor in 1951, Helen Maud Cam. (Her portrait, hung in University Hall’s Faculty Room in 1995, was precedent-setting in the same way; see “First Swallow of Summer,” May-June 1995, page 62.) Cam became the first woman to attend Morning Prayers, instituted in 1638, Gray writes, “simply by virtue of going and sitting down in the chapel each day.” One conceives of her, and Gray, as daunting—every bit as much as the “very lively group” of political scientists, including Henry Kissinger, Samuel Huntington, and Zbigniew Brzezinski, to whom Gray was introduced by her brother, Fred, concurrently studying at Harvard’s school of public administration. As the first female tutor in history and literature, Gray found that the Signet Society “was reluctantly forced to let me attend the obligatory tutors’ lunches.…There the waiters, if not the members, made me feel at home.” Then again, as an assistant professor of history attending departmental lunches, “Women were not allowed through the front door of the Faculty Club, only through a side door (and not, of course, in the main dining room).” Perhaps channeling her inner Cam, Gray “took to going through the front door” and “the prohibition gradually faded away.” She first entered Lamont Library (coeducated in 1967) as a member of the Harvard Corporation. Was the construction, or at least reinforcement, of a carapace an adaptation to her times? What was lost when women were relegated to the side door—and gained when they pried open the front? And who remains “outside” today? The second sterling takeaway from Gray’s “academic life” is a crystalline understanding of the academy’s essence and role. For her, that likely arose from primal memories and family accounts of her father’s crushing experience of the Nazi destruction of the Hochschule für Politik, in Berlin, where he was appointed Carnegie professor of international relations and history in 1931. A private, independent institution, it was politically neutral, diverse in views and party affiliations, and committed to education for citizenship, training for public service, and scholarly research. Within two years, as Hitler ascended, “Students were to play, and were asked by the party to play, a central role in the ‘purification’ of universities and in the public displays of book burning in 1933.” After that April, he—and half the entire Hochschule faculty—emigrated in the wave that brought to the United States, particularly, a formidable generation of German scholars. He made the crisis an occasion to offer a kind of running seminar on the questions of what a university was for, why it mattered, and why the activists’ views, demands, and actions threatened its integrity and most important purposes by attempting to make the university an instrument of social and political change, confining the freedom of its members, and promoting an anti-intellectual spirit where the free life of the intellect should be paramount. His eloquent speeches and communications constitute some of the best statements on the fundamental nature and role of universities that I know. My parents and their fellow refugees survived the most extreme assault ever launched against universities from a totalitarian regime bent on reconfiguring…universities, and the disciplines they taught and studied, into its own ideological image, distorting their purposes to serve its own ideological ends. The academic refugees had witnessed also the passivity and widespread complicity of the professoriate from which they had been dismissed. These émigrés brought with them to America a faith in the prospects of academic freedom and its goals. They were hopeful about the potential of the still-youthful universities of their new country to be freer, more democratic, and more open than the rigid and conservative institutions they had known at home even in better days, and they found those hopes in many ways fulfilled. Thus Hanna Gray was annealed into a champion of the academy. But it would be wrong to miss a third theme running through her narrated life, harking back to that citation about her “incisive wit.” She displays throughout the book exactly the kind of intellectual, pointed humor that is a reminder of the humanity within, indeed at the base of, any successful leader—in this case, in the quirky community of scholars. Nor will readers learn how this intellectual historian came to chair the board of trustees of both the Andrew W. Mellon Foundation, the nation’s leading source of philanthropic support for humanities scholarship, and the Howard Hughes Medical Institute, ditto for biomedical research. That in itself indicates what kind of a leader she became during the course of an academic life—in turn a reflection of the toughness, clarity of vision, and inner humanity that university leadership at its best requires.